The Swiffer is a great invention. It makes cleaning up a kitchen, bathroom, or other hard surface so much easier than it was before. However, there are some drawbacks. Regular Swiffer pads are disposable. You have to replace them each time that you clean, often using more than one during a single cleaning session. Therefore, the cost adds up. Plus you're not doing any kindness to the Earth when you dispose of them. However, you can nip that problem in the bud by making your own removable, reusable Swiffer pad cover. Take a towel or any piece of cotton fabric, create your cover, then when you're done cleaning, just toss it in the wash. These also make great gifts. Use cute towels to make cleaning up a little bit more fun. 1. Measure your Swiffer to determine the right size for your Swiffer pad. Most Swiffers are approximately 5 inches by 10 inches. 2. Place your cutting mat on your work surface. 3. Place your old towel atop the cutting mat. 4. Place the transparent measuring grid atop the old towel. 5. Measure and cut one piece from the fabric that measures the same size as the Swiffer measurements that you took in step one. 6. Measure and cut two additional pieces that are each half the width of the Swiffer measurements that you took in step one, allowing 2 inches for seams. 7. Place the two pieces that you cut out in step six on top of the cutting board, with one placed directly atop the other. Trim the length so that it is 2 1/2 inches more than the length measured in step one. For example, if your Swiffer was 10 inches long then you should trim this fabric to be 12 1/2 inches long. 8. Trim the large piece that you cut out in step five to that same length. 9. Lay the larger piece face up on the cutting mat. Place one of the smaller pieces face down on the larger piece, aligning the two bottom edges. 10. Use straight pins to pin the two pieces together across the bottom edge. You will likely use five straight pins. 11. Repeat steps nine and ten, except that this time, align the second small piece with the top edge of the large fabric. 12. 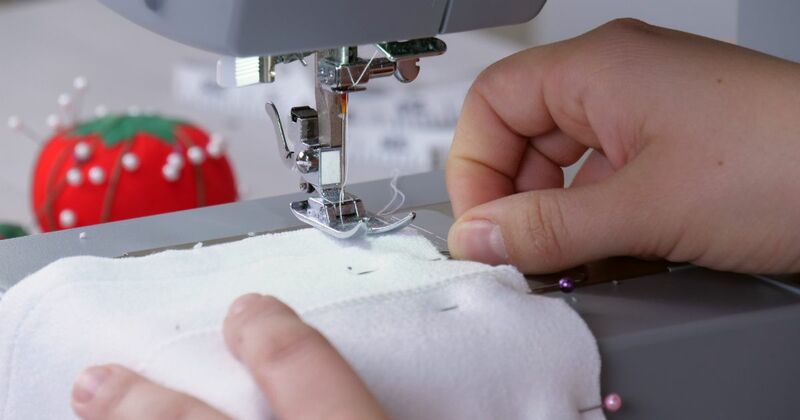 Use a sewing machine to stitch together the two pinned sections, removing the pins as you go. Use your thread cutter to snip the thread at the end of each row. 13. 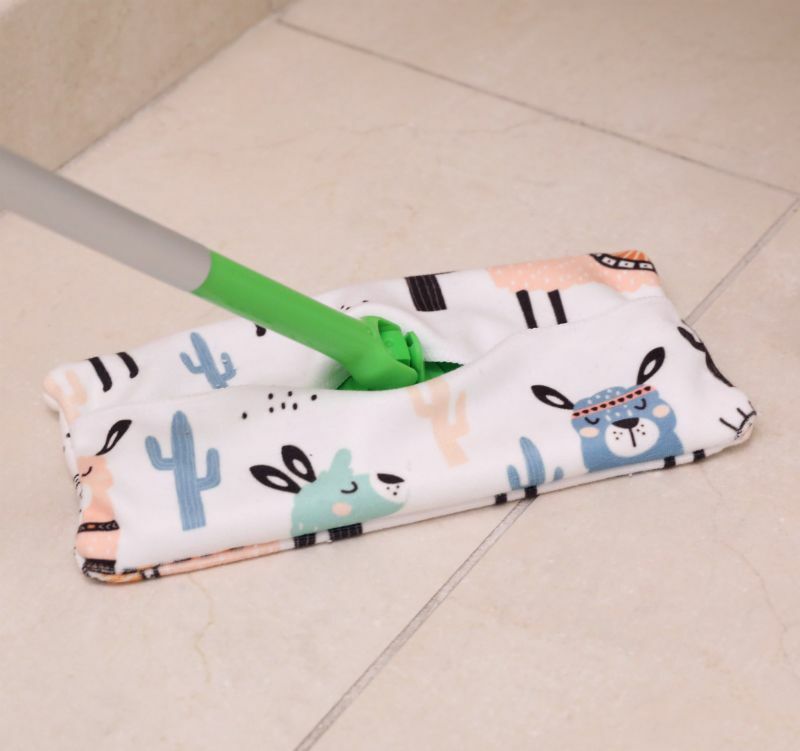 Fold the Swiffer pad along the two seams that you've created, with the wrong side facing out. Pin each of the short ends, then stitch them together with your sewing machine, removing the pins as you go. 14. Use scissors to cut a small diagonal edge off of each corner. These will get pressed into the grippers on the top of the Swiffer to hold the pad in place. 15. Turn the Swiffer pad inside out so that the right side now faces you. You may have to reach inside and poke the corners out. 16. Place the cover over your Swiffer. It's ready to use. When you're done cleaning, simply remove it, and toss it in the laundry.